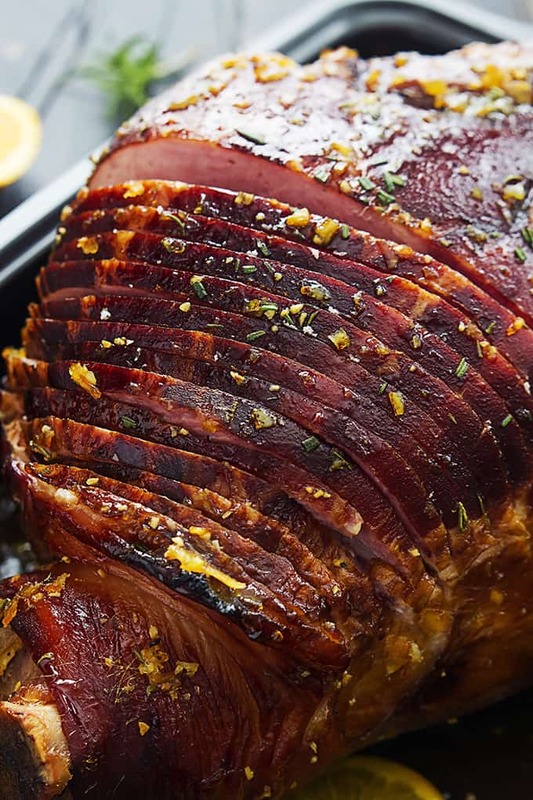 Juicy oven roasted Rosemary Citrus Glazed Ham slathered in a sweet and savory rosemary citrus glaze! Perfect for your holiday meal! I adore holidays. Each for a different reason – although, let’s be honest, those reasons often revolve around food. St. Patty’s Day is in just a few days and I am very very excited because my favorite color is green and hello, St. Patty’s Day is all about green things. We are attending not one, but two parties for this beloved green holiday. We take our Irish heritage seriously in this house. But after this holiday is over, it’s on to EASTER! The thing about Easter is that it is like a Spring Thanksgiving I feel like. I always prefer ham to turkey so my mother makes ham and turkey for Thanksgiving, but for Easter it’s 100% all about that juicy ham. And the potatoes. And the green beans. And the raspberry jello. 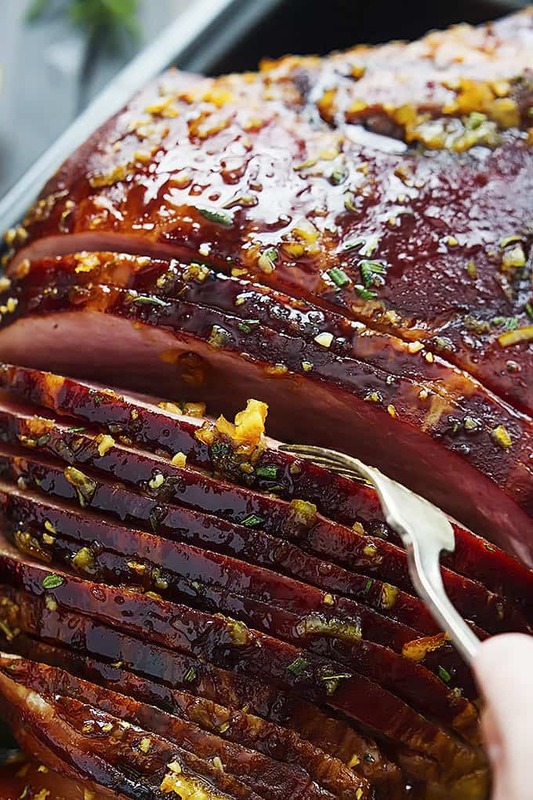 But mostly about the ham and this year a brand new crazy-good glazed ham recipe is my Easter gift to you. I absolutely love this glaze because it’s got a little bit of everything a good glaze should – a little tang + a little sweet + a little savory. Mmmmm. so. darn. good. WAIT there’s more! 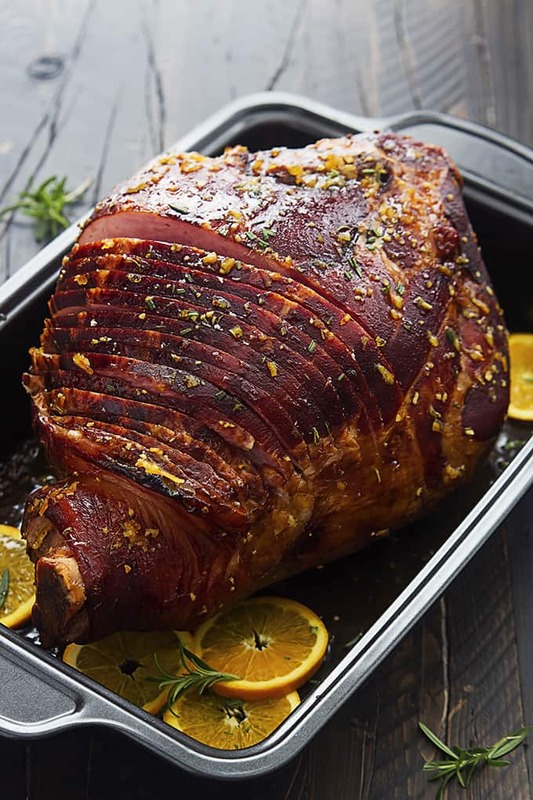 🙂 Not only am I giving you a stellar new recipe to try for this Easter holiday, I’m also going to help you order your very own gorgeous bone-in ham from Jones Dairy Farm. Bam! Happy Wednesday! Instead of stressing about finding a good ham in the stores when everyone else is looking for the same thing, just order it online from Jones Dairy Farm! That’s where this succulent beauty is from that you see in my pictures and I am in love with how perfectly cured and tender it is. Want one of your very own?? Then you should hop over to enter their giveaway for your very own FREE bone-in ham and roasting pan! Man, this day just keeps getting better. Use code HAM20 for 20% off of any online order before March 20th. Click HERE to order yours! Click HERE to hop on over to the full recipe!! I teamed up with Jones Dairy Farm to bring you this tasty ham recipe – all opinions are 100% my own. Thanks for letting me work with the brands I love to keep this blog going! As I was scrolling through this I realized I was nodding the entire time and saying, “oh yeah, UH HUH.” So delish looking. Wow! This ham looks incredible. I have to say it’s one of the most beautiful hams I’ve ever seen and the flavor sounds delightful! Oh my gosh Jen thank you that’s so sweet! The flavor really is SO amazing – sweet, salty, tangy, I love it! Rosemary and citrus is such a lovely combination: I’m sure this would be wonderful! Beautiful pictures as always! I will be making this for Easter! So excited!